They took him out of the car. The man was a wreck, he was barely able to lift his head and his deformed legs lied in a wheelchair. Two monks carried him slowly, with extreme care, as if he would fall apart at the slightest shock, like a mummy with a soul in it. A 95 years old Tibetan, what did you expect? At least he made it that far, his generation of Buddhist masters was nearly extinct, after a lifetime keeping the meditative transmission alive. Yet something was not right for a guy in such a poor physical condition: he was smiling, he looked extremely happy, even ecstatic. And he was holding a rose, which made him look beyond cute (he would often come to new places with a rose in his hand, probably a symbol of some sort). That guy was Chogye Trichen Rinpoche, one of the very last accomplished Tibetan teachers (he was the primary instructor of the Dalaï Lama). Since I saw him, I gladly dumped my beliefs about old age. I thought getting old consisted in chocking in a decaying body, resenting young people who enjoy what you once had and fearing the imminence of death every second. But if you look at the diversity of mindsets among the elderly, you have to admit that grouchy and useless old farts are only a fraction of the senior population, we just notice them more because they reinforce our belief that the twenties are the only age worth living. In reality, youth is a short moment in life, if you make it to your 70th mile, it’ll account for a mere 15% of your total lifespan. And there’s a lot of experiences to enjoy after your glorious teens, I can personally confirm that fact, now that I’m transitioning slowly towards seniority. I must even confess that I enjoy the process of getting old a lot more than growing up. Let’s face it: passed thirty five most guys look like a heap of bloated intestines soaked in beer and Jäger Meister. They blame it on age, and I give it to them that some physical attributes indeed decline right after graduation. But still, most marathonians perform best at mid-age, so booze, TV and absence of exercise are to blame, and sorry, but age is just a pretty pathetic excuse. On my end, although dealing with depression has become tougher, I’ve never been as athletic as now (at forty one) even if I don’t work out more than four times a week. As long as you don’t smoke and drink every other day, don’t worry too much about the atrophy of your physical shell, you have more time than you think. When I was eight, I was bored all the time, and I despised cats, because cats are boring animals. My grandmother had about twenty three of them, they were everywhere in her house, all they enjoyed was sleeping and being left alone. To reward them for their self-complacency I’d chase them with a windex bottle or I’d kick them out of the way. It’s only fair, right? I had to spend my afternoons in a country house when all I wanted was to go to amusement parks and get all wobbled up in the scariest rides. Much later, the same lust for sensation pushed me in techno arenas where I could at last get high, lost, bombarded by visuals and sounds. Now, 30+ years later, I enjoy solitude, naps, and a ray of sunset on my couch when I wake up, just like cats. My tastes for art followed the same minimalistic curve: I love Ambient (the most minimal form of music), and movies such as Baraka. I no longer need chemicals highs and a 112db wall of sound to dodge boredom. After a few years of sensual hysteria, a quiet moment on your own is a treat, and time is a privilege you savor all the more as you value its non-renewable nature. And this is a good thing. You might turn out sour, aggressive and incredibly stupid with age (that’s what happened to my neighbor downstairs), but the large majority of the people I know grew more tolerant with age and experience. I have a simple theory around that: it’s all about suffering. If life smears a liberal amount of problems and failures along your path, you tend to empathize when you witness other creatures going through the same challenges. And that’s a good thing, because that pain/compassion process softens the republican that lives inside of us, it makes us less opinionated and ruthless, and clearly a nicer person to be around. Remember this dude you always wanted to be? That man is you, now. Did you keep track of who you wanted to be when you were a kid? I’m not talking about your dream career as a fireman or a cosmonaut, chances are you ditched those for a more realistic project like accounting or sales. Yet, what personality traits did you want to develop? What kind of adult did you want to be? Can you recall that? What did you want to be back then: kinder, stronger, more knowledgeable? Chance are that’s who you’ve become. Because they were made a long time ago, kids dreams have had time to manifest at adulthood, but we often forgot about them and we’re already chasing something else. Still, there’s a lot of defects you dumped since you were a five year old, embarrassing your mom at the supermarket for an extra snicker bar, you definitely improve, didn’t you? I did not like myself when I was a kid: I was small (by definition), powerless, desperate for attention, very nervous and talkative. I would tell any lie to be listened to, and I was aware of my miserable situation, but I just couldn’t stop. So I dreamt of becoming a quiet guy who can stay silent on demand. And I did become that, although those who’ve known me for a while know how emotional I am inside. It’s nearly impossible to assess one’s own progress over a two year span, but a few decades can make a man change, in short: expect great results at an older age if you start to change early enough (anything before 30 is pretty messy, overall). Provided you don’t give in to peer pressure, the second half of a human life can also be liberating. It’s easy to understand why: at forty, you’re not a serious part of the race anymore, nobody cares if you graduated or not, you can’t expect any applause if you succeed and you don’t fear being booed off-stage either. There’s no stage anyway, and your mom no longer sits in the audience, your life belongs to you, now. You’re on your own, and that’s a good thing, because the limiting factors of social conditioning start to loosen up, you’re freer…if you want to. Getting old is a lot cooler than you fear, if it wasn’t for the fear of becoming an oddball. This freedom is not going to enjoy itself, though, you’ll have to actively tap into it, make your career move, start that university curriculum on the late or take a sabbatical year on a greenpeace boat. Again, that’s only an option available to you, if rat racing is what you want, you can keep running down to the retirement home, and end up at eighty three, comparing the number of visits you had with your mate next door. 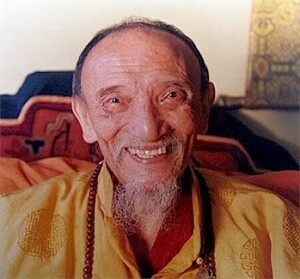 Another option is to invest as much time as possible helping everyone around you, to age as gracefully, radiant, blissed out as Chogye Trichen Rinpoche, whom I was incredibly lucky to have seen alive. This phase of human history is unique: we never lived that long, that free and with such an incredible access to knowledge. This might not happen again, I’ve committed to make full use of this privileges, even as an old fart, how about you?